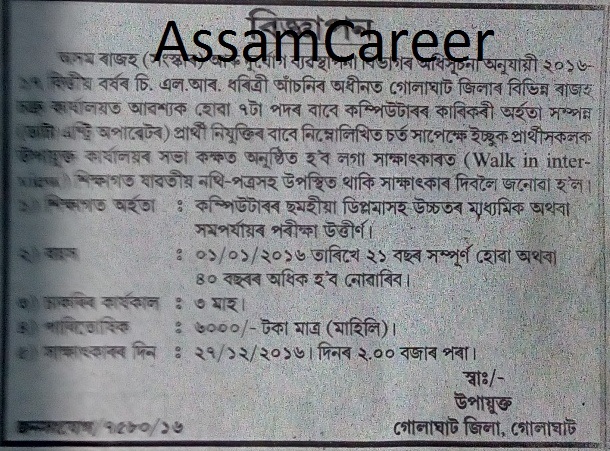 Intending candidates are hereby called for Walk-in interview for the recruitment of 7 posts of Data Entry Operator at various revenue circles of Golaghat district to be held at Deputy Commissioner Office, Golaghat. Educational Qualification: Minimum HSSLC passed with six months Diploma in Computer Application or equivalent. Venue: Deputy Commissioner Office, Golaghat.